This is a play on words on Mishlei 27:24, which translates as "riches (khosen) are not forever" but the poster reads "Hassan (Nasrallah) is not forever". Another slogan says: חסן לא חסין - "Hassan is not immune, protected". Is there any connection between the various meanings of this root? I would like to preface my answer by saying that there is a wide range of opinions and theories in regards to this root. I will try to present many of them, but I can't guarantee one unified theory. In Biblical Hebrew, the root חסן appears in words with two basic meanings: a) something stored or protected, and therefore also riches, treasure and b) strong, strength. In Aramaic, starting with the book of Daniel, and continuing to Talmudic Hebrew, we find a number of additional meanings. 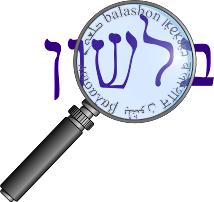 It can mean to take possession of, to inherit (or to bequeath), and that is the translation used often by Onkelos to translate the Hebrew נחלה nachala - inheritance. It can also mean "to strengthen one's self, to control one's emotions" and appears in the Targum for התאפק. Steinberg connects all these meanings under a general sense of "to close, to stop, to hold tightly". From here he derives the meanings of "strong and strength", and "inheritance" has the sense of "closing in his possesion". And the meaning of storage - something closed away from others. Klein, however, says that the meanings "to be strong" and "to store" have different etymologies. The first has cognates in Aramaic and Arabic, where as the second - "to store" - is connected to the Akkadian hasanu (= to comprehend, shelter) and is probably connected to אסן (stored, piled up). "place where goods are stored, esp. military ammunition," from M.Fr. magasin "warehouse, depot, store," from It. magazzino, from Arabic makhazin, pl. of makhzan "storehouse," from khazana "to store up." (This site also describes the etymology of "magazine", and connects the meanings of storage and strength.) According to Kutscher, the Hebrew word machsan not only derives from the Arabic, but actually was "inspired" by the European languages using the word "magazine". Kutscher also provides an interesting cognate. We are all familiar with the word chazan חזן - meaning a cantor, a leader of prayer. However, the original meaning was an officer, a superintendent. Kutscher finds a number of examples in the Talmud where a chazan meant a guard - for example Bava Metzia 93b, where it mentions חזני מתא, which Rashi explains as "guards of the city". This would seem to be similar to the Arabic machzan. However, there is an opinion (Barth, Geiger) that machzan is actually of Persian origin, and Kutscher writes that if this is true, then the connection between chazan and machzan is just a coincidence. He continues by saying that the origin of chazan may be from חזה - he saw, making a chazan an overseer. But there are theories that contradict this as well. In the end, he writes that we simply don't know if there is a connection between חזן and חסן - and provides a Rashi (Makkot 22b), where Rashi admits he also doesn't know the origin: ולא שמעתי שום משמעות "I have not heard any explanation (for the word חזן)." Returning to machsan, Stahl quotes the French linguist Guillaume (not sure who exactly) as saying that the root חסן meaning "store" is related to the ערי מסכנות - cities of storehouses - mentioned in Shmot 1:11, with some switching of letters.